Outsourcing and globalization have placed huge challenges on manufacturers. Most OEMs have been able to resort only to inbound inspections, strict T&Cs, or supplier plant inspection tours. However, these are mostly retrospective activities, which result in costly reworks and manufacturing delays if products don’t meet standards. It is one thing—and not an easy thing—to attempt visibility in logistics processes,1 but quite another to have visibility into operations in far-flung plants. 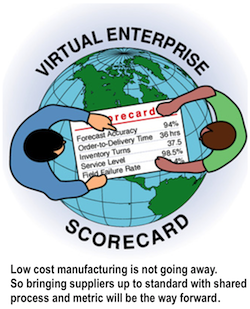 Manufacturing solutions for the cloud have been slower to adopt. 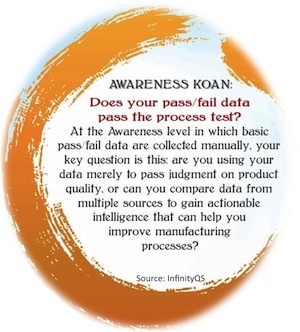 A few firms like Plex Systems, NetSuite’s Manufacturing Edition and now InfinityQS are breaking the rules and providing that visibility required to assure high availability of information and quality assurance for operations in global manufacturing. I recently met with InfinityQS’s CEO Michael A. Lyle and Ed Van Rens, Demand Generation Manager, at InfinityQS and got some great insights on their evolution to a fully functional cloud quality solution. We had been followers of the evolution of their ProFicient solutions for a long time. A while back they launched a version for small manufacturing: a cloud version enabling the small and midsized firms to embrace quality solutions but without the big upfront investment in tech. After all, implementing quality processes in itself can be a big leap forward, requiring a lot of process change, elimination of paper processes, and data rigor. Turns out, though, that larger companies wanted a deeper solution in the cloud, too (and smaller firms wanted to grow into more functionality— read Small Companies have Big Company Needs ). Thus, ProFicient 5. What is interesting about this solution is not the cloud access, so much, but the ability to now provide the multi-site, high availability capability to peer into the floor operations of these outsourced processes. Large customers like Cooper Tire and ConAgra to small companies like Trek and Ben & Jerry’s2 can all embrace this more advanced approach to managing locally and globally (see Figure 1). We consistently hear about the quality issues, especially coming from contract manufactures, regarding low cost operations. Yet using these low-cost approaches as an option to reach global markets and reduce cost is not going away. The alternative is to bring them up to standard. This requires not only technology access, but designing processes that are implementable and maintainable. Designing a process and then operationalizing/automating it used to be two separate tasks. But today users can expect more ‘live’ workflow, using the workflow not just as a static tool to design processes, but also using it as part of the actual operational monitoring. This can be an easier approach than looking at lots of control charts, for many users. The ability then to drill-in, drill-across into the location or work center can occur (see Figure 2). Many Asian operation and outsource partners are still ‘low tech.’ We still can’t expect the low-cost manufacturing to have ultra connectivity and make intense investments. So providing methodologies to get them connected from the OEM or headquarters with a cloud solution that they can tap into is important. Technologies like wifi and mobile are readily available, but the investments in large servers, etc. are difficult and require onsite IT. So providing an array of data input devices and sensors that can provide input to the cloud can help users leap over the low tech environments in these plants. One of InfinityQS customers—a good example of connecting low tech in a big way—is a bicycle manufacturer with plants in Taiwan and China, in which, through the cloud, they can monitor activities, reducing errors, reducing scrap and improving manufacturing production efficiencies. 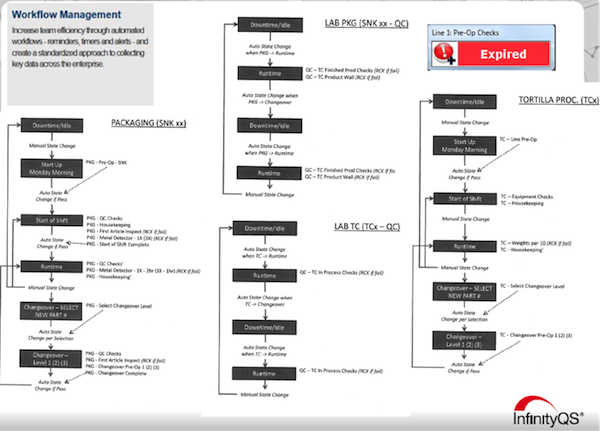 Disconnects between management reporting and operational execution. Here is another challenge in visibility. Needs at each level in the organization are different—process control at the line level vs. strategic decision making about plants, capital investments, at the executive level. Many companies have resorted to purchasing a variety of solutions to address these challenges. But system to system integration can reduce the timeliness and the ability to drill into the ‘why things are happening.’ Real-time monitoring probably needs to be part of the reporting/BI capabilities at all levels. The ProFicient OEE dashboard addresses that kind of fusion from shop floor to executive floor. 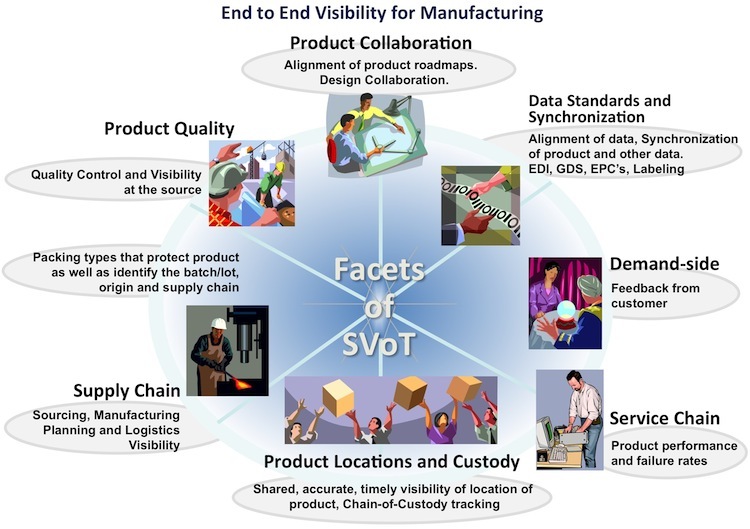 With more pressure being exerted by consumers and government for companies to adhere to high quality product standards as well as manufacturing’s own concerns about quality and reliability, getting connected to and maintaining visibility of end-to-end operations is a must. This was out of reach even for the largest companies. There are just so many end-points to connect to, just so many training classes to conduct. Cloud technology that leverages local data collection methods seems like the breakthrough we need to finally get us the visibility we required. Manufacturing cloud solutions are a truly positive option for all company sizes to consider. With the profusion of sensors and wireless everywhere, the granular source data ‘has a place to go’ to ultimately provide that needed immersion in operations wherever they are occurring.